In an attempt to better serve the university community, The Daily will take on an additional form: an ever-evolving, constantly updated news website. The site will debut May 31. The new site will feature all of the content that previously appeared in the newsletter in an easy-to-navigate format—plus tons of all-new material. All subscribers still will receive a daily enewsletter to their inboxes, but the enewsletter will appear in a more readable, abridged format that drives users to the website for more information. 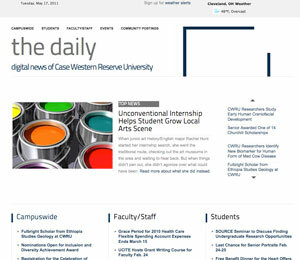 The new format allows the university community to stay up to date on Case Western Reserve news throughout the day, as news happens. Looking for something to do tonight? Visit The Daily and check the events calendar. Want to see the latest scores from the Spartans? Check out the athletics Twitter feed right on our site. Simply need a quick—and we mean quick, of course—break from work? Make The Daily site your homepage and visit often to find out about all the recent happenings on campus. Plus, you can connect with the community through new items like polls, a featured Twitter account from various people across campus and a brand-new message board. The message board, billed on the site as Community Postings, allows CWRU users to post university-related announcements that may not fit within the established guidelines of The Daily. This could include anything from a departmental meeting to a call for donations for an on-campus bake sale. Users will be required to log in, and all content is subject to the editor’s approval. Download the editorial guidelines for all content here. Stay tuned for more details on the new version on The Daily, and be on the lookout for the revamped version, hitting inboxes May 31.